Karachi, for me, is perfect despite its imperfections. 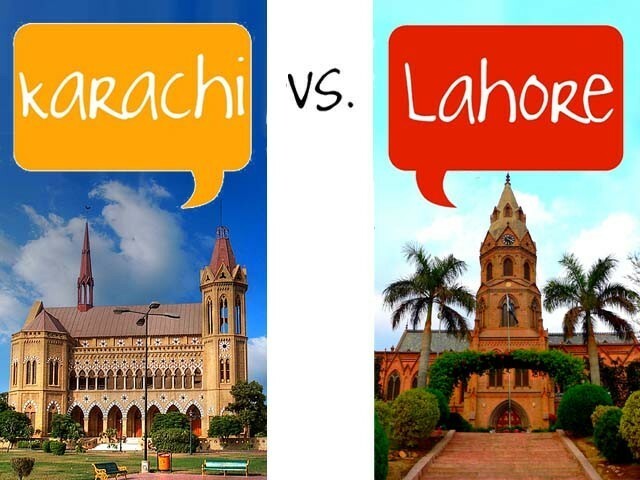 Yet, Lahore is not lagging far behind Karachi when I think of my choicest places in Pakistan. I am a Karachiite to the core. I love my city’s hustle bustle. I adore the variety of culture Karachi offers, especially as it is not a unilingual city. I know its sights and sounds by heart. Karachi, for me, is perfect despite its imperfections. Yet, Lahore is not lagging far behind Karachi when I think of my choicest places in Pakistan. In fact, in some ways, it even has an edge over Karachi. “O baji jee kuch naheen hota. Karo karo aap phone karo,” he reassures. For someone who has suffered from attempted mugging twice in that last one month alone, this Karachiite felt relieved. I simultaneously felt a little envious seeing children riding bikes when I visited a friend in the newly populated Defence locality of Lahore. The friend, a diehard Karachiite, has recently moved to Lahore unexpectedly with his entire family. They seemed very at home in Lahore. “You all have become total Lahoris, haan?” I said. And they confessed that this was true. Karachiites are flocking towards Islamabad, and more towards Lahore, in search of safer pastures. It’s a better place to bring up your children who will have a less chance of growing up with safety-related phobias. Isolated incidences happen here too, but overall it is definitely a safer bet. Literally. It’s a semi-chilly February afternoon. My friend Ayesha, who is one reason why I wish to frequent Lahore, honours my wish to take photographs, and takes me to Aitchison College. The gurdwara, mandir (temples) and masjid, all are charming beyond words, due to both the red bricks and the feel of pluralism they lend. But perhaps the prettiest thing about Aitchison, and Lahore generally, is the trees. Lawrence Garden (now Bagh-e-Jinah), alone, has some 150 varieties of trees. Islamabad has more trees and plantation, and the air is crisper and purer. But Lahore’s trees are mostly aged and huggable; they have a certain character. They have seen the world. They are wise. They are the backdrop of the historic buildings that make Lahore what it is. The Lebanese food at the renovated Faletti’s Hotel at Lahore reaffirmed this: While Karachi offers everything a foodie can ask for, Lahore is in no way lesser in terms of being a food haven. From the authentic experiences of the Lahori masala fish of Daarul Maahi to themithai (dessert) of Laal Khooh, and from the fancy eateries at M M Alam road to the variousfood streets (the one near Badshahi Masjid is not the only one), it is a foodie’s paradise. Organic and healthier food alternatives are also more readily available. But I struggled with my need for a good paan after dinner. Lahore needs to import someone from Karachi to make good paans and perfect its repute of being the ultimate food hub. Lahoris are zinda dil (lively), truly, as are all Pakistanis. And a safer environment makes that easier. From theatre and grabbing just the right books from “readings” to musicals at Yusuf Salli’s Haveli, it has a lot to offer for those who want to live it up. For the wanderers, an added advantage is that places like Islamabad and Nathia Gali are at drivable distance. Some of the best educational institutes, with the most beautiful campuses, are here, as are places of history and culture. And Lahore doesn’t go to sleep early, just like Karachi, which makes it easier for a Karachiite to settle in. At what was supposed to be a nashta (breakfast), I am at the third floor of a thin house in inner Lahore, visiting a family I have not met in decades. Her children, in their teens, are taking selfies with me, while their father is frying stuff for us in the kitchen. From adjacent rooftops, people are waving. On another day, a random person, himself a photographer, agrees to pose for me as I find him an interesting subject for photography. There is a certain openness in Lahore that I love. Lahoris are not afraid of emoting openly. They laugh, cry and share readily. While there are cons to this behaviour, there are definitely many pros. Without stereotyping, I would have to say that I end up making connections in Lahore more readily than any other city. There is a lesser bureaucratic and also a less hurried, guarded and agitated feel toLahore’s people. Perhaps this is one of the biggest reasons why I love Lahore. Posted in Uncategorized and tagged Aitchison, Karachi, Lahore, Pakistan, Photography, Travel. Bookmark the permalink.